Walmart wire racks are popular with consumers for many reasons. They are a great and cost effective way to reduce clutter by getting a storage solution into place that makes sense. Walmart wire racks and Walmart shelving storage are always great solutions. Regardless of whether you have a very limited amount of storage space, or an abundance of space in your home, these Walmart wire rack and Walmart shelving storage solutions are often the perfect remedy. Probably the best known use for wire racks and wire shelving storage are closet organizers. Everyone can benefit from it because who wants to waste space? Walmart wire racks and shelving storage aren’t just for home use. Wire rack and shelving storage solves many warehouse shelving needs as well. After all, Walmart wire racks shelving and shelving storage are very popular in many industries. They are also used in food service, pharmaceuticals, medical supply and food distribution centers. A major benefit of these shelves is they offer several advantages over other types of shelves. There are many different closet organizers to select from, including the popular and inexpensive Walmart wire rack and Walmart shelving storage solutions. 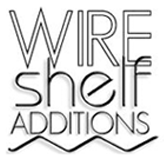 At Shelf Additions, we offer a variety of wire rack accessories for Walmart wire racks. If you are looking to add to or expand your wire Walmart wire rack, we have you covered. We supply everything from wire shelves, post extensions, leveling feet, and more that are compatible with Walmart wire racks.